Seventeen-year-old Reagan struggles to determine reality from nightmare. She thought one night changed her life forever, but her fate was written long ago. Destiny may have determined her fate, but she refuses to allow it to define her path. To defeat evil, she must embrace her role in its destruction and trust in guidance from above. In doing so, a battle cry emerges: With Faith, We Fight. Tia Silverthorne Bach has been married to her college sweetheart for twenty years, has three beautiful girls, and adores living in sunny California. Her daughters were born in Chicago, San Diego, and Baltimore; and she feels fortunate to have called many places home. She believes in fairy tales and happy endings and is an avid reader and rabid grammar hound. She is an award-winning, multi-genre author and an Editor for Indie Books Gone Wild. From an early age, she escaped into books and believes they can be the source of healing and strength. If she's not writing, you can find her on the tennis court, at the movies, reading a good book, or spooning Jif peanut butter right out of the jar. 5.0 out of 5 starsAMAZING series! The Tala Prophecy Series is so addicting you'll find it hard to put down. It's unique, engaging and a wonderful paranormal coming of age story. Reagan is a force and she's got an emotional strength unlike any I've read. With so many twists and turns thrown at her left and right she plows through and is determined to fight the evil coming after her and win. If you're looking for an amazing paranormal, shifter, coming of age story then I highly recommend the Tala Prophecy series. 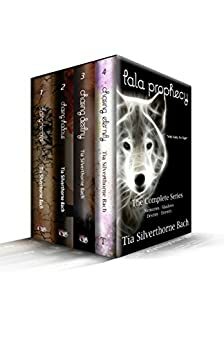 I love the Tala Prophecy series! I love that the author has a strong female character. She weaves many paranormal/supernatural beings into the story in an imaginative way! When Reagan and her family go to Yellowstone on a family trip, the worst possible thing happens. Sam is taken away, possibly dead and Reagan is severely injured with little memory as to what happened that night. With her nightmares becoming worse, she tries to put the pieces of that night back together but her mom wants to keep her on the medicine which only makes matters worse. Who can she trust? The voices in her head, the new boy in school Rafe and his family, her parents, or the one in her dream? Find out in this amazing first story from the Tala Prophecy! Now free from the hospital, Reagan and Rowan run for safety. Knowing her Grandfather is alive and well, her only choice is to trust him, Rowan and their pack. Reagan's focus is trying to get her brother back but he's been with Rafe for awhile now, will her brother now be corrupt? Along the way, she discovers more secrets about herself and the bloodlines she has flowing through her. Will it be enough to keep those she loves safe? Can't wait to find out what happens next! As Reagan and the group near her and Winona's 18th birthday, they discover more and more about the prophecy that's set forth. Will they be able to defeat Rafe and the devil himself? They will need the help of each other, Angels and the vampire clan to stay out of there way. Will they be able to convince the vampires to side with them? After all, Rafe has already tried making deals with them as well. Whose promises will win the head vampire Lucent allegiance? Will they all make it out alive each time Rafe and his army ambushes the group? Can't wait to find out what happens next! What a great finish to this amazing series! This story is the final battle between good and evil. Some will fall and one side will win. Whose side will you choose when all is said and done? You will have love and betrayal when you read this but will you know who the betrayer is? I really enjoyed how this book came full circle at the very end of the book with relation to the series. 5.0 out of 5 starsAbsolutely Fan-freaking-tastic Series! Finally finished and I so wish there were more to the series. This is one of the most exciting series I've read lately. The story is addictive and impossible to put down. All the characters are inspiring. Tia is one hell of an author, with the imagination of a great writer who pulls you into a world of learning and violence. I guarantee that you'll fall in love with this series, I know I did. Thanks Tia and please keep writing cuz I promise I'll keep reading anything you do.